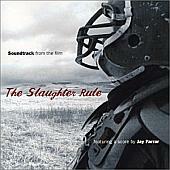 It took a few listens to really enjoy The Slaughter Rule. I'd lie awake trying to get the feel of this album when my mind finally gave up to sleep. The dreams that came were of the drive on old 178 in Southern California. It's a lonely Highway that drags through the stark grays of Pinnacles National Landmark on its way to Trona, a dingy sulfur-smelting town. We drove that road a lot in the 4 years we lived in the near by Ridgecrest. As a boy it was my first understanding of emptiness, and this album captures that same feeling like nothing I have encountered since. Jay Farrar acts as caring father to Bloodshot Records first soundtrack, a very mellow collection of songs by a who's who of artists including Vic Chesnutt, Ryan Adams, and Neko Case intertwined with a score by Farrar himself. It has two of the things that I feel makes a good soundtrack: 1) songs both old and new and 2) someone behind the scenes that understands the subtlety of blending songs into the ones surrounding them. On top of this Farrar's score is high quality adhesive good enough to stand out as enjoyable tracks themselves. It has a definite country feel to it but the good kind, like the stuff that use to play from the AM radio in my Dad's 1974 Chevy Blazer. If you're looking for a an album with a slower pulse but still a good flowing sound, this is a great CD. Rating: B.